BIN ADJECTIVE LADEN: SETTING THE RECORD STRAIGHT - mudd up! 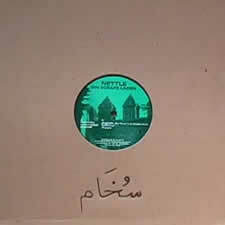 In 2001 I released a 12″ EP called Bin Scrape Laden. It hit shops around February, well before the September 11th deadline… On the inner vinyl ‘run out groove’ I had them inscribe the standard airport security phrase: “Are you carrying anything that might be considered a weapon?” The vinyl disc came packaged in rough cardboard record jackets that I hand-branded with the Arabic word for ‘Soot’ (and nearly burnt down the Madrid apartment Rocio & I were renting, but that’s another story). When 9/11 happened, a lot of people who knew the record got in touch, asking — only half-joking — if the C.I.A. had contacted me. I came up with the name after I’d read breakcore pioneer DJ Scud’s 1998 article on Osama Bin Laden (which is weird in & of itself) in Christoph Fringelli’s Datacide zine. Scud had turned in an incredible remix for the EP. And most of the sounds I was sculpting those days sounded a lot like scraped-up trash bins. So the title clicked into place, although nobody got the play on words… until September 11th came and reconfigured our world. Here’s a track from Bin Scrape Laden, produced by yrs truly under the name Nettle in the simpler days of 1999/2000. It’s named after a (sadly defunct) Pans y Company bocadillo. So yes, I am available for presidential-level geopolitical consultation gigs and/or palm readings. The “hidden moral” of this story is that it takes a lot of time, money, and people to make vinyl records, even weird Arabic influenced noise-beat ones with a strong prophetic bent. In Casablanca last month Maggie and I went to the address of Hassania Editions. A major major label in the 70s, 80s, and beyond. Nothing but a dental surgeon on the top floor. The motorcycle shop dudes next door had no idea. The guy selling candy in a nearby doorway remembered, vaguely, when it had closed. About five years back. We walked around the neighborhood, a ‘popular’ one which would feel like a dangerous slum in the Americas but in Morocco it felt – was – safe, active, the opposite of shady. Spicy greasy bread and the best almonds I’d ever eaten and the first disc seller is peddling Zinga Zinga video CDs — humorous Gaddafi youtubery. Because sometimes you have to laugh. To keep from… I bought the MP3 CD this unlabeled tune came from at the second disc seller. I can’t make out the name(s) in the beginning… Carlos? Anybody? It’s gorgeous. 11 minutes, a stroll rather than an appointment. Make it to the nine minute mark and you get rewarded by one of those Maghrebi rhythmic accelerations that remind you you’ve been drinking tea all day. That the heart can quicken. That love is real. That time runs in one direction: out. Previous Previous post: HOW CAN WE BE SURE PAKISTAN EXISTS?